Joshua Tree rock climbing guide is a necessity for women who want to brave the Joshua Tree National Park. Not only will the activity keep you fit and limber, it also gives you front row seats to one of the strangest yet most beautiful places on Earth. However, a Joshua tree rock climbing guide will be a requirement if you are a novice climber. But before you hire several rock climbing women to show you the ropes, there are a few simple tips that can give you the proverbial running start. Don’t forget to stretch and warm up. Climbing a rock may not look like a high-impact workout, especially if the climber is experienced and graceful, but it is a very demanding physical activity that will stress every major muscle group in the body. Like all high-impact workouts, climbing requires you to stretch your muscles prior beforehand in order to avoid injury. Plan your route. If you ever take the time to observe veteran rock climbers, you will see that they start by staring at the rock or wall in front of them for a while. They are not stumped. Rather, they are mentally preparing and planning their route in advance. This does not mean that they can’t deviate from the planned route, but it helps give them direction. You can learn how to do this by instinct, but only through practice and repetition. Prioritize technique over strength. Let’s face it. Women like us are at a disadvantage when it comes to raw physical strength. There are exceptions and women who are exceptionally strong, but by nature’s design there are things that men can do through sheer brute force. When it comes to rock climbing, we can’t match men’s sheer upper body strength, but we can rely on technique instead. A joshua tree rock climbing guide can teach you techniques that let you climb places you normally can’t. Study the lingo. This is another one where a Joshua tree rock climbing guide will be of great help. When climbing with another person, communication is vital. So it will make both of your jobs easier if you can learn what she means when she says on belay, take, lower, or any of the other basic climbing terminologies. Our guides can give you a crash course on these climbing words. Lastly, it is important to remember that falling is part of the process. So you need to prepare for that eventuality, and learn how to fall safely. Practicing it will make each climb that much safer. Thankfully, you don’t have to do it alone because the women of rock climbing that make up Joshua Tree Uprising’s team of instructors will be on hand to guide you. Ready to go on your own adventure? 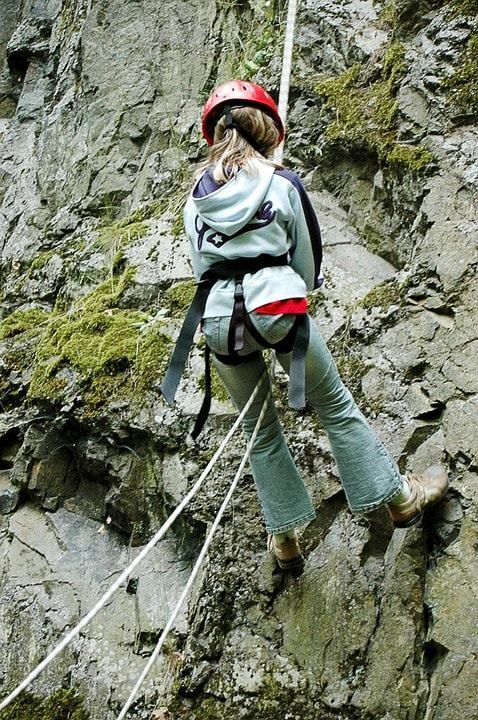 Get to know our team of friendly rock climbing guides.